Become a "code breaker" as you tackle messages from space! "Cosmic Card Sorting" introduces and helps your participants classify some common "Deep Space Objects." Even little ones will have fun decoding "Secret Messages"
"Picture Analyzer" familiarizes your group with filters -- an important astronomer's tool. "Seeing Through Alien Eyes" reinforces the concept of filters in a cooperative and truly entertaining way. 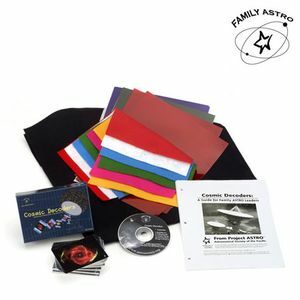 Learn about past and current attempts at interstellar communication with "Message to the Universe," "Decoding Radio Messages from Space," "Translating an Alien Message," "Sending a Family Message into Space," and "Who Speaks for Earth"
Contents: Leader Guide (includes all event handout masters/training videos), Cosmic Cards, Color Filters, Colored Felt, Hourglass Nebula Poster (for "Picture Analyzer"), Audio Compact Disc (for "Decoding Radio Messages from Space") and Sample Take-Home Game (4-in-1). Event handouts and game instructions are also available in Spanish. Contact Customer Service. You may also be interested in purchasing the Take-Home game Cosmic Decoders. Other kits in the series include Night Sky Adventure, Race to the Planets, and Moon Mission available as Leader Kits and Take-Home games (see recommended products below).